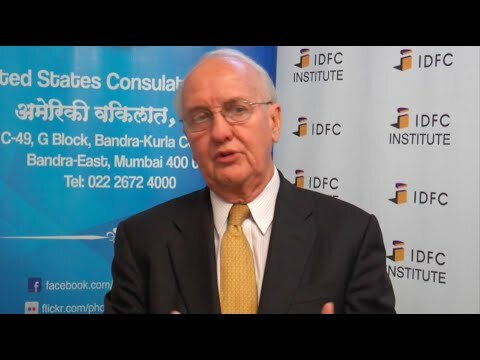 Raymond Vickery, Former US Assistant Secretary of Commerce for Trade Development, joined us for a private IDFC-U discussion on US FDI and the Asia Infrastructure Investment Bank (AIIB). While the roundtable was held under Chatham House Rules, key points discussed are summarised below, along with our video interview by IDFC Institute's Vivek Dehejia. This roundtable was presented in collaboration with the Consulate General of the United States, Mumbai. During the discussion, the US-India relationship was considered to have evolved greatly from the time between India’s independence and 1991 when India opened its economy, to today. Before, the US and India were described as estranged democracies, while today, the alignment of interests and values has propelled a strong relationship. FDI was described as the proverbial “win-win” situation, and to attract FDI, the Indian government was encouraged to work on Ease of Doing Business measures- particularly contract enforcement and predictability of rules. Much seems to depend on the political will of current leaders, because of which investors worried about changes in rules if and when leaders changed. The US was recognised as the biggest outbound foreign direct investor in the world, but the amount of US investments coming to India are underestimated, as many of these funds are routed through places like Mauritius and Singapore. A warning was sounded against policies that confined nations inwards, and a strong argument was made in favour of larger, free markets that allow for specialisation. Market-driven solutions were called for to drive prosperity, which could then be used to provide a safety net for citizens. This was not only a prescription for developing countries, but applies equally to the damaging effects of protectionism in the US and other major economies. Reducing tariffs within and across countries was favoured. The US was said to have made a decisive move towards progress when it combined the economies of its 13 colonies, and India’s current efforts to implement a Goods and Services Tax (GST) were seen in this light. Many historical examples support this position, such as Europe’s progress after creating a monetary union, the Soviet Union’s collapse after creating an insular economy, the contrasting experiences of North and South Korea, and India’s growth after its 1991 reforms. On average, India was said to have tariffs six times those of the US, and three times those of China. There was criticism of India’s system of deciding tariffs with reference to bound rates, which allowed for arbitrariness in rules depending on the discretion of administrators. China was said to have been successful in attracting more FDI than India because of its ability to “make deals stick.” Yet, a UN survey found that India was the third most desired FDI destination- a promising sign for growth. The “Make in India” drive by the Indian government requires large investments in manufacturing, which needs imports, better port regulations, lower corruption levels and stability of rules. The government was encouraged to hasten such reforms and reduce its control over the economy, especially through its massive Public Sector Undertakings. Five of the eight Indian companies that made the Fortune 500 list are state-run. The US, too, was called to make changes that would open its economy, such as relaxing laws that prohibit the export of crude oil- a measure that favours oil refining companies in the US. The infrastructure finance requirements of Asia are so vast, that AIIB, BRICS, and other such institutions were thought to be welcome additions. India is currently the World Bank’s leading customer, and there are still large infrastructure funding requirements in India. But the shape the AIIB could take is still in question. The bank needs 10 members representing at least 50% of the share votes to ratify the agreement, but so far only Myanmar has done so. The group noted that the bank’s dealings would be in US dollars, and that AIIB members are also required to also be members of either the Asian Development Bank or the International Bank for Reconstruction and Development (which is the original World Bank institution) - two organisations that many say the AIIB will rival. The World Bank President’s expression of support for the AIIB was lauded. There was also support for a move away from coal towards non-hydrcarbon sources of energy. Solar, wind, natural gas and nuclear sources were considered promising alternatives. China’s aspirational announcement to cut its greenhouse gas emissions per unit of GDP by 60-65% from 2005 levels was appreciated, and in the run-up to the UN climate change talks in Paris, it was hoped that India would also express such commitments. However, it was also recognised that per capital energy consumption in India is 700 kWh versus 13000 kWh in US, and so measures that need to be taken by different countries should be differentiated accordingly. Raymond E. Vickery, Jr. is a leading expert concerning US-India relations, and played a primary role in the passage of the US-India civil nuclear legislation. He served three terms in the Virginia legislative assembly and as an advisor on India in campaigns of Senator Obama, Vice President Gore, and Senator Kerry. He was also instrumental in Secretary of Commerce Ronald Brown’s seminal mission to India and the US-India Commercial Alliance. He is the author of "The Eagle and the Elephant: Strategic Aspects of US-India Economic Engagement". He is Of Counsel to the Washington, DC law firm Hogan Lovells and a Senior Advisor to the international strategic consulting firm Albright Stonebridge.